CanadaVet.com Blog: Giant George is Large than Life! Giant George is Large than Life! 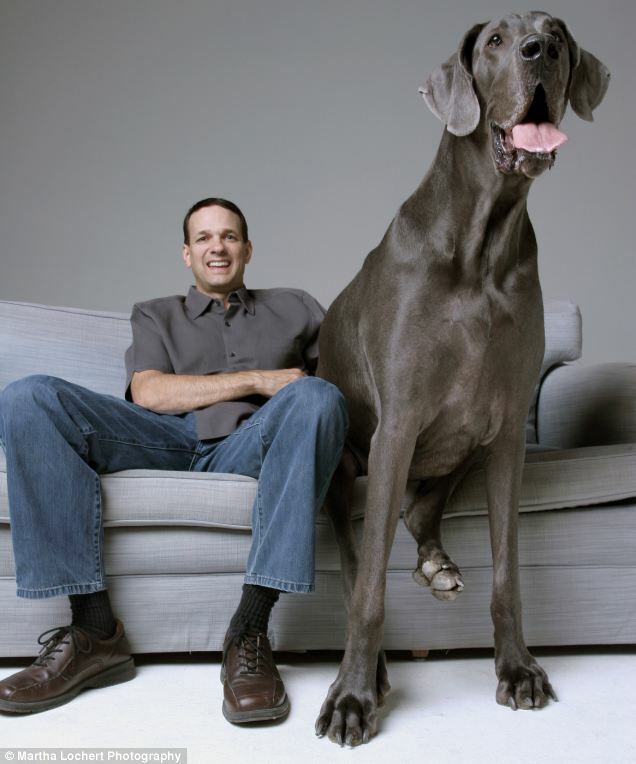 After picking out there new puppy from a litter of Great Dane’s, both Dave and Christie new that they were going to have a large dog, however having a 'giant' dog was not something they had prepared themselves for. 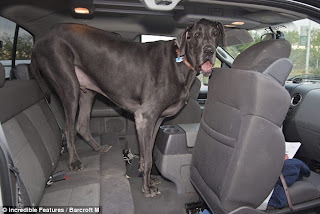 They never dreamed that the new puppy they had just brought home was soon to become the biggest dog in the world; standing at nearly 4ft high at the shoulder and 7ft long! Finding a fitting bed for George proved to be challenging as he eventually outgrew the single mattress that had been placed at the end of his owners bed for him and instead took a liking to the comfort of their king-sized bed — sprawling between them like some over-indulged prince while his owners spent half the night clinging onto the edges. They soon solved this problem by buying George his own queen-sized mattress, which he still sleeps on today at the bottom of Christie and Dave's bed. A sausage on the barbecue had to be guarded at all times. You couldn’t turn your back for a minute. He was even so tall that he actually had to bend down to pinch food off kitchen counters. He could reach the high shelves as well, so the family had to start hiding everything away in cupboards. Soon, he was getting through around 100lb of dry dog food every month. His owners have described him as a 'gentle giant' that they wouldn't trade for the world - he is said to even be afraid of chihuahuas! It seems Giant George has also won the hearts of people around the world, with his own fan club, website and 70,000 fans on Facebook. Can you imagine taking him for a walk?